My mom, Anna Bernice Morris, passed away on 1/10/06 at the age of 93. My brothers and sister are Barbara Ann Morris Campbell ('60), Jerry Morris ('61), and Eddie Morris ('71). 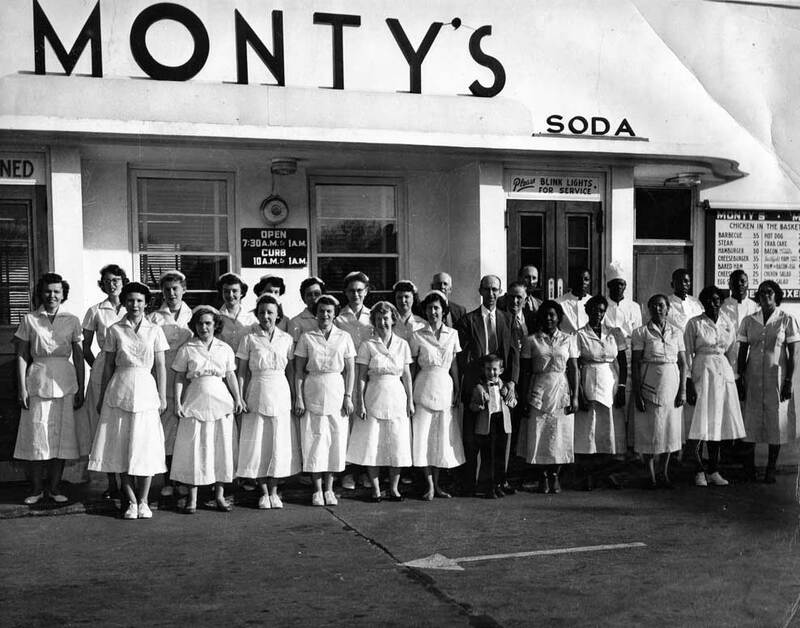 I have included a pic from family photos of Monty's Restaurant when it was on Virginia Avenue. My mom worked there until it was closed. She frequently enjoyed meeting and serving many of her long and cherished patrons from NNHS - Julie Conn, Cowboy Range, Johnny Palmer, Warren Mitchell and many more from the late 50's until it closed. She was loved by all who met her. Oh, Donnie - I'm so sorry to hear this. Your mama sounds like such a loving person. You have our deepest sympathies. NEWPORT NEWS - Anna Bernice 'Nannie-Belle' Morris, 93, passed away peacefully on Jan. 10, 2006, surrounded by her family. She was born Dec. 11, 1912, in Essex County, Va., and was a member of Calvary Baptist Church in Newport News. For over 25 years, she greeted hundreds with a warm smile and a newspaper at the 46th Street shipyard gate until she was 81-years-old. Nannie enjoyed spending time with special friends like Mrs. Deaver, Varon 'Veo' Godwin and Willie Gilliam. She never met a stranger, had a kind word for everyone and touched more hearts than she can ever know, including the guards who routinely helped her set up her paper stand at Northrop Grumman Newport News. Nannie was loved and cherished dearly by her family for her generous spirit and unconditional love. She was preceded in death by her parents, Eva St. Claire Harmon and William Cole Brizendine; sister, Ernestine Hillis; brother, Morris Brizendine; brother, William Brizendine; and her husband, John G. 'Jack' Morris. She is survived and will be deeply missed by her sister, Kitty Black and husband, Reid; her four children, Barbara Campbell and husband, Bud, Jerry Morris and wife, Cheryl, Donnie Morris and wife, Tammie, and Eddie Morris and wife, Pam; eight grandchildren, Sherry Jefferies and husband, Jimmy, Michael Campbell, Lissa Morris, Brandon Morris and wife, Josie, Jordan Windle and husband, Keith, Lindsay Enzor and husband, Wayne, McKenzie Morris and Jessica Schenk; and six great-grandchildren, Devin Campbell, J.J. Jefferies, Jared Jefferies, Destiny Morris, Zachary Morris and Joshua Morris; and numerous nieces, nephews, family and friends. The family would like to express their gratitude to the doctors, nurses, and staff at Riverside Hospital. The family will receive friends from 6 to 8 p.m. Friday, Jan. 13, at Peninsula Funeral Home. Funeral services will be conducted by the Rev. Joe Hunt at 1:30 p.m. Saturday, Jan. 14, at Peninsula Funeral Home. Interment will follow at Parklawn Memorial Park. Published in the Daily Press on 1/12/2006. God bless your family at this sad time. Nannie will be missed by so many people and will always have a place in our hearts. I will miss seeing and talking to her as she sat on the back porch. We always talked when we saw each other. Though it saddens me now that she's gone, I know I will talk to her again someday soon.